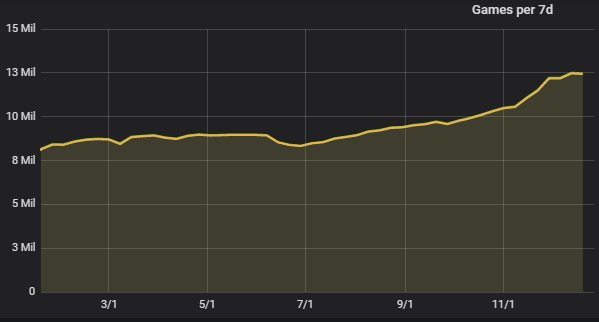 It’s been a huge year for Lichess, with a record number of events and a massive increase in users. In fact, there has been so much growth that we finally had to add an extra front-end server to cope! 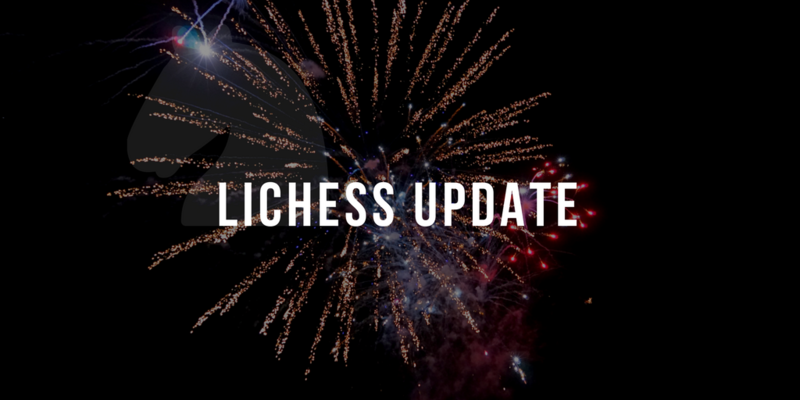 Lichess is not just growing in numbers, though – the hard work of our developers has brought about many new features and technical improvements. We’ve also expanded into new areas, including some forays into journalism and a string of special events. Please join us in celebrating the achievements of the year and looking forward to what the next one will bring! On December 2, the billionth (1,000,000,000th) game was played on Lichess! That’s 10x more games than three years ago. Over the course of the year we have been working behind the scenes to make this possible. We upgraded the main server and database servers, implemented more efficient game storage, tweaked kernel parameters and improved websocket handling. We’re now able to simulate realistic load on our test servers, so more performance improvements are to come. As always, you can view our costs, fully funded by your donations. improvements to the broadcast feature, which was tested to its limits with the live replay of events throughout the year. These included the World Chess Championship, the 2018 Candidates Tournament, Tata Steel, and many more. It was even used for the St. Louis live coverage of the WCC. Not bad for a feature in beta testing! We had a great reaction to our call for more events, so in addition to the regularly scheduled programming we hosted a number of special events. We hope you enjoyed them as much as we did, and look forward to more! It’s not all online, either – Lichess is making an impact in the “real world” too. We had three hugely successful meetups this year and participated in a conference. It was great to meet so many enthusiastic members of the Lichess community! London Chess Conference - where we gave a small demonstration of Lichess capabilities, specifically for chess in education! Overall it has been a great year for us. We hope you enjoyed it too and look forward to meeting 2019 together!